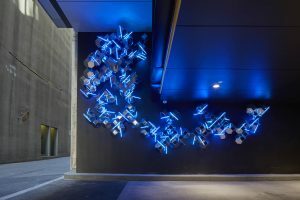 This permanent wall work was commissioned for a new building on the corner of Spring Street and Flinders Lane in Central Melbourne. Perun Cloud is illuminating dark urban laneway, transforming the space and creating an experience for someone walking through. @35 Spring Street, Melbourne, Australia.